I am probably the neighborhood mom that all the kids complain about. I don’t hand out candy. I figured they get enough candies from all the other homes. At least I’m not as bad as my neighbor Mike who makes children do push ups for candy. He’s a personal fitness trainer. He would probably hand out protein bars if it were safe for babies. Glow sticks. It has yet to fail me year after year. The kids love them. I get the bracelet ones with the connectors so it can also be a necklace if they had two. Play-dough. You can find them with the candy stuff in big super stores such as Target or Wal-Mart. 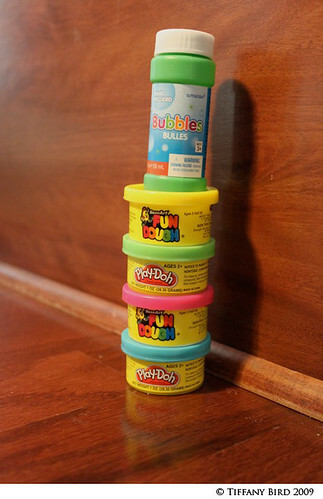 Bouncy balls. Or other party gift bag toys found at party stores. Bubbles. The small bottles found in party stores. Pretzels or crackers. Individually pre-packaged of course. Nothing homemade. I have also seen people who attached their business cards to whatever it is they are handing out the kids. I guess that is one way to advertise. Your neighbor actually does that? That is so funny!! I would love to see that. I love when my kids get something other than candy, and so do they. Especially since I have 1 with a nut allergy which rules out a lot of candy.